Scots could be offered their own passports as part of a radical proposal to allow them to live and work in the European Union after Brexit. The Scottish Parliament is examining a plan drawn up by academics which aims to ensure Scots are able to continue to enjoy free movement with the rest of the EU. Revealed by The Herald, the passport plan, will look at the risks facing the country as the UK prepares to split from the Brussels bloc, while finding solutions to benefit Scotland. One of the central proposals offered up by the experts is that a devolved Scotland could issue its own national insurance numbers for Scots to use to apply for jobs in Europe. 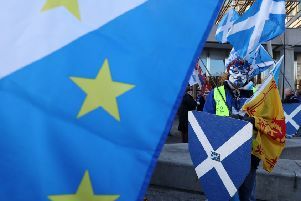 The team of academics also suggested that the Scottish Government could grant Scottish-only National Insurance numbers to EU citizens already living in Scotland or who wish to take up positions in the country. The draft initiative is the brainchild of professors Damian Chalmers of the London School of Economics and Anad Menon of King’s College London who believe such NI numbers, combined with address information from the electoral roll, would form the basis of “documents additional to their passports which could serve to secure them free movement in the rest of the EU”. Their ideas have gained traction in Holyrood circles as well as with Scottish academics, Nina Miller Westoby of Glasgow University and Jo Shaw of Edinburgh. Miller Westoby and Shaw described continued free movement in Scotland after Brexit as “more plausible than at first blush”. They wrote: “Increasingly immigration control is taking place within the UK, in situ, for example by landlords obliged to confirm residence status before renting property, rather than traditional immigration control at the border, and this may be a means in which a differentiated immigration approach is developed. Such a scheme may mean devolving control over wider migration from Westminster to Holyrood. An act which UK ministers, including Scottish Secretary David Mundell, have already expressed reluctance to do.